On September 24th, 2010 the FBI carried out raids on seven activists’ homes and the office of the Minneapolis-based Anti-War Committee. Along with these raids, fourteen people were delivered subpoenas to serve before a grand jury, including our sister Tracy Molm, active member of Students for a Democratic Society at the University of MN. Nationwide, activists throughout many sectors have come together to protest and demand an end to the ongoing harassment and intimidation of anti-war and international solidarity activists. In December 2010, under the direction of U.S. Attorney Patrick Fitzgerald, the FBI delivered 9 new subpoenas in Chicago to anti-war and Palestine solidarity activists – bringing the total number of subpoenaed activists to 23. Patrick Fitzgerald’s office is ordering the 9 to appear at a Grand Jury in Chicago on January 25. In response, the Committee to Stop FBI Repression is calling for protests across the country and around the world to show solidarity with the subpoenaed activists. It is clear to us that the FBI is engaging in a fishing expedition with the aims of criminalizing and squashing any dissent against U.S. imperialism. Students for a Democratic Society stands in solidarity with all anti-war and international solidarity activists, and any activist who holds in mind the necessity for real change in our system. We unite with the Committee to Stop FBI Repression’s call to protest on the 25th of January and we are calling on SDS chapters throughout the nation to do the same. Protest, Chalk your campus, hand out flyers, write articles! Stand together for progressive activists on January 25th! Don’t let our rights be taken away! 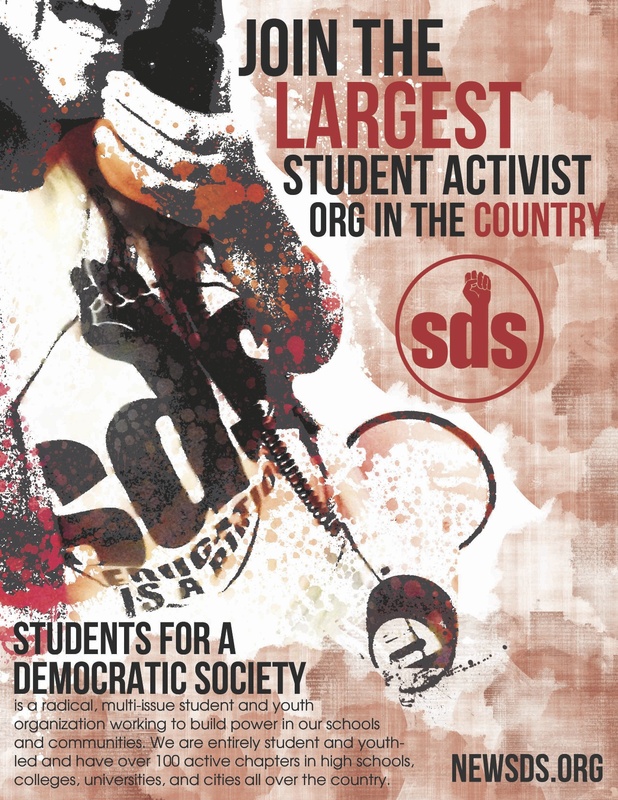 Email students4democraticsociety@gmail.com to let us know what your chapter plans to do! It now appears that the investigation of the U.S. Attorney is focused on small donations to the daycare and women’s center projects of the Union of Palestinian Women’s Committees, an NGO registered with the Palestinian Authority with local offices in towns across the the West Bank and Gaza. The Union is a progressive women’s organization that strives to build respect for women’s rights. In December 2010, under the direction of U.S. Attorney Patrick Fitzgerald, the FBI delivered 9 new subpoenas in Chicago to anti-war and Palestine solidarity activists – bringing the total number of subpoenaed activists to 23. Patrick Fitzgerald’s office is ordering the 9 to appear at a Grand Jury in Chicago on January 25. In response, we are calling for protests across the country and around the world to show our solidarity. Hundreds of organizations and thousands of people will be protesting at Federal Buildings, FBI offices, and other appropriate places, showing solidarity with the 9 newly subpoenaed activists and with all the activists whose homes were raided by the FBI. Fitzgerald’s expanding web of repression already includes the 14 subpoenaed when the FBI stormed into homes on September 24th, carting away phones, computers, notebooks, diaries and children’s artwork. In October, all fourteen activists from Chicago, Minneapolis, and Michigan decided to not participate in the secret proceedings of Fitzgerald’s Grand Jury. Each signed a letter invoking their Fifth Amendment rights. However, three women from Minneapolis – Tracy Molm, Anh Pham and Sarah Martin – are facing re-activated subpoenas. They are standing strong and we are asking you to stand with them – and with the newly subpoenaed nine activists – by protesting Patrick Fitzgerald and his use of the Grand Jury and FBI to repress anti-war and international solidarity activists.